Published: March 28, 2012 at 02:32 p.m.
NFL owners voted Wednesday to change the regular-season overtime rules to match the playoff format and have turnovers automatically reviewed. The rule to have all replays handled up in the booth (eliminating the six to ten minutes it takes an NFL official to saunter over the replay booth on the field) was denied. As was an extended trade deadline (which should have passed). The new overtime rules were inspired, in part, because of the outcry of the 2008 AFC playoffs when the Chargers beat the Colts in overtime without Peyton Manning every touching the ball. Funny, because under the current rules, the game would have still ended the same way because Darren Sproles finished the game with a touchdown run. Besides, it sparred Manning from throwing the game-ending interception, which was coming anyway. But the point is, this isn't the first time a player inspired NFL rules. So with that in mind, I'm looking at the six biggest rule changes inspired by a player. Now, I did consider the Hines Ward rule (no blindside blocks with the helmet), the Roy Williams rule (no horse-collar tackles), the Greg Pruitt rule (no tear away jerseys), the Emmitt Smith rule (can't take off your helmet in celebration), the Bert Emanuel rule (the ball can hit the ground on a catch) and the Chad Johnson rule (no using props in end zone celebrations). But none of them made the cut. I also didn't include the Tom Brady rule because it was already on the books, and it was just an added clarification to protect the injured Patriots quarterback. But still, don't let it stop you from going into the comments section and writing "Where's the Tom Brady rule?" followed by the assorted name calling and open pontification of why I have a job. So just let's get to the list. This rule was enacted in 2003 and declared that long hair was a part of the uniform, as it should be. If you want to grow your hair long, then you should be ready to deal with the consequences. Of course, Williams cut his dreads in 2004, but in 2006 it was Troy Polamalu who was the one taken down by his hair, so maybe a name change is in order. In 1981 the NFL outlawed the use of Stickum, a glue-like substance players applied liberally to their hands. Well, that's most players. Hayes put Stickum on his hands, socks, helmet and pretty much everywhere. And it was so excessive the league had no recourse but to ban it. Who knows what kind of career Braylon Edwards could have had if this rule was never enacted. Dempsey set an NFL record when he booted a 63-yard field goal in 1970. And booted is the proper adjective -- Dempsey was born without toes and his shoe was flattened into a golf club, which gave him an unfair advantage. Though, you might say Sebastian Janikowski is getting an unfair advantage from the chili cheese fries he eats, giving him added girth. But he's still not swinging a club. Quarterbacks were only allowed to throw a forward pass from five yards behind the line of scrimmage in 1932. The Portsmouth Spartans (eventual Detroit Lions) coach that year complained Nagurski wasn't far enough back from the line of scrimmage as he threw passes during the 1932 NFL Championship Game. The refs allowed Nagurski's touchdown to Red Grange stand as the Bears went on to win. The following year, the league changed the rule to allow all passes from behind the line of scrimmage. Jones was the innovator of the "head slap," which is exactly what it sounds like. One offensive player tried to thwart Jones by sharpening the buckles on his helmet, which only seemed to motivate Jones. But finally, the league stepped in and banned the practice in 1977. The famed "Holy Roller" spawned this rule. 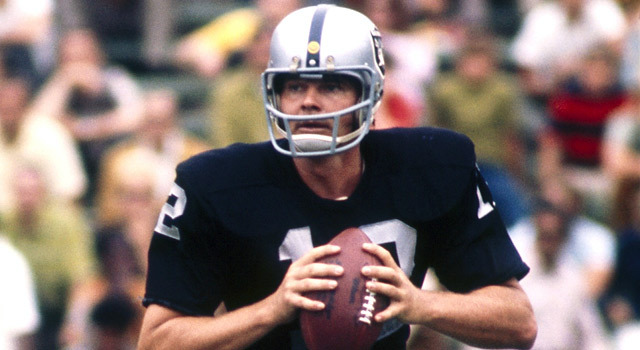 With the Raiders trailing in the final seconds at San Diego in 1978, Stabler was scrambling in the pocket and instead of taking the sack on fourth down he "accidentally" fumbled forward. The ball was subsequently kicked by Pete Banaszak, and then kicked again by Dave Casper, who recovered the ball in the end zone for the win. Just watch the play. Does that noise seem like it should be legal? Well, the league thought not. The Stabler rule prohibits an offensive player other than the player who fumbled the ball from recovering or advancing a fumble on fourth down or on any down in the final two minutes of a half. And if another player recovers, the ball reverts to the original spot of the fumble. Oh, and Stabler admitted he fumbled it on purpose. Of course he did. Seriously, watch the play. Who doesn't think that was on purpose? Other than the referee Jerry Markbreit. Agree or disagree, contact Rank via Twitter or via Facebook. Also be sure to catch the latest on the Dave Dameshek Football Program.